KISSIMMEE, FL -- Prom-posal season is underway and high school students across the nation are getting creative with how they ask prospective dates to the big dance. Unfortunately, all that work may have accidentally gone to waste on Astros catcher Jason Castro. Castro is in Florida for spring training and it seems one teen thought it would be fun to spell out "Prom?" on the side of his car. The only problem: it was the wrong car. 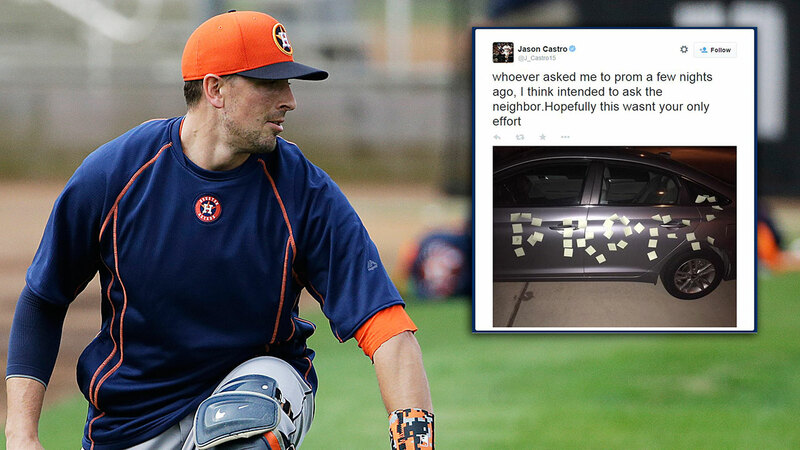 Castro tweeted out a photo of his Post-It plastered ride on Wednesday, saying "whoever asked me to prom a few nights ago, I think intended to ask the neighbor. Hopefully this wasn't your only effort." In case you were wondering, he has officially declined the invite - but he is still poking fun at the incident, tweeting out "I am loving all the responses to this unfortunate mix-up. I hope the asker isn't feeling dejected over his intended date's nonresponse." He also posted "Life lesson: due diligence pays off...and lack thereof leads to Twitter posts." Because of the Twitter uproar, the intended target may have seen the prom-posal after all. And for what it's worth, if Castro had said yes, he already had the blessing of the MLB who posted on its Cut4 twitter account that "you can take @J_Castro15 to prom as long as you have him home by midnight."